Our comprehensive Spanish dictionary, flashcards, grammar reference, comprehension activities, and writing tips give you exactly what you need to learn Spanish better and quicker. It's the only Spanish learning app that is all integrated - making it definitely the best Spanish study app for Spanish students. Download it now! - learn to speak Spanish easily! Our bilingual Spanish dictionary and thesaurus includes more than 32,000 entries. Convenient bilingual search allows you to quickly navigate to the word you’re looking for in Spanish or English. If the word doesn’t exist in our Spanish dictionary, use the “translate” function built in and WordReference.com™ will translate it! 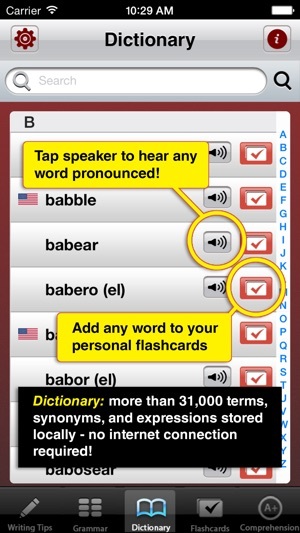 Add any word from the Spanish dictionary to your Spanish flashcards to easily study Spanish vocabulary. 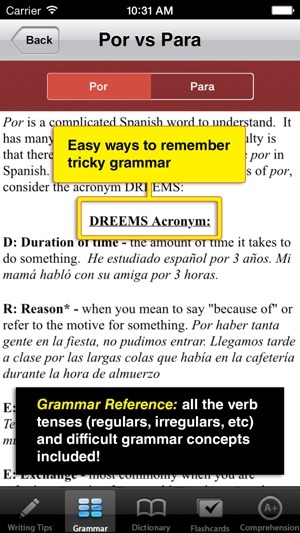 Studying Spanish gets easier with a complete Spanish grammar reference at your fingertips. We use catchy mnemonics and songs for studying Spanish grammar. 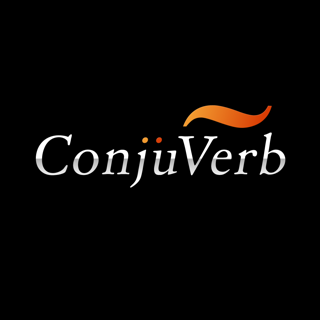 In addition to clearly lined out Spanish verb conjugations for regular and irregular verbs in all 14 tenses, find help for challenging topics like Ser vs. Estar, Por vs. Para, Preterit vs. Imperfect, Indicative vs. Subjunctive, and more! Both IB Spanish and AP Spanish classes require you to write Spanish papers. 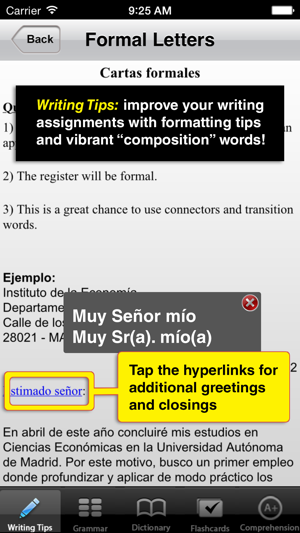 The High School Spanish app helps you learn Spanish writing conventions and write better Spanish. Each different type of text contains Quick Tips with a helpful formatting reference and examples. Plus we provide you with key lists of Spanish transition and Spanish composition words that make it easy to get that A on your next writing assignment. Thousands of Spanish Flashcards organized for efficient and easy Spanish study! We've selected the most common Spanish vocabulary words that every Spanish student needs to know. 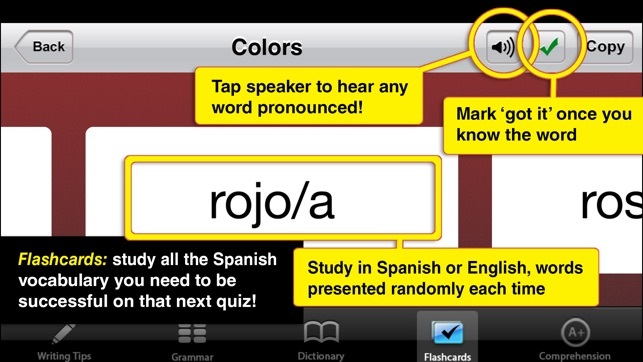 These pre-made Spanish flashcards are one of the highlights of this Spanish study app. Flashcards are organized thematically for beginning Spanish students, and organized by category (nouns, verbs, adverbs, adjectives, etc) for more advanced speakers. 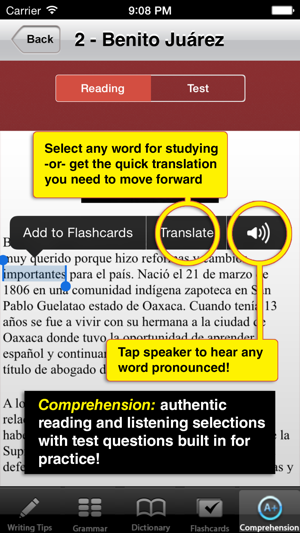 Students can activate the Quizlet ™ feature (in-app purchase) to study thousands of pre-made Spanish flashcards! We integrated this Quizlet ™ feature because many teachers are uploading their specific vocabulary lists to Quizlet.com for their students to study. Use the Quizlet ™ integration to study the Spanish flashcards you need! 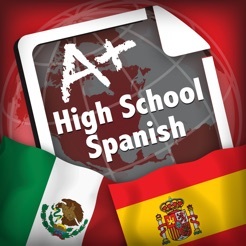 The comprehension section of this Spanish learning app was modeled after the AP Spanish comprehension tests to help you learn Spanish comprehension and prepare for your upcoming tests. You can test your reading and listening comprehension with authentic fiction and non-fiction texts and audio samples. Get scores immediately, and access “hints” to help you understand your mistakes and see where the real answer is within the given comprehension test. There is no better way to improve your AP Spanish test scores and prepare for your AP Spanish test than to practice! High School Spanish is the best Spanish study app on the market because it makes learning Spanish manageable. 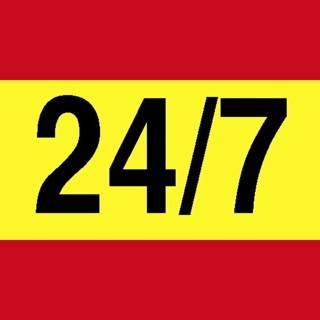 It's only Spanish study App you need to learn Spanish and have immediate success with your Spanish classes. It's a must-have for any student trying to learn Spanish at any level. Get it today and see how it makes studying and learning Spanish much easier! I recently bought this app for my iPad Air. I constantly have to rotate my iPad because it keeps switching from landscape to portrait and turning upside down. In the comprehension section, the translate feature does not work. The flashcards have no definitions that I am aware of. Whilst trying to write the developer, the contact form on the website didn't function. It's not worth paying $5 unless these issues are fixed. This app is also not appropriate for beginners. Total waste of money only opens as a shell with no data in dictionary etc:- this app has not been updated in years. I bought this APP and it would never load so my daughter could not use it. A waste of money UGH!